I was excited to score a bunch of beautiful fresh lemongrass and cilantro in Chinatown this weekend, and even more excited that it only set me back three dollars. The produce was vibrant and crisp and looked and smelled so beautiful together that I decided to use them both as the dominant flavors in a tofu dish. I combined them here with some spicy notes of scallions and galangal root to make a kind of herbed stuffing, which I then filled into some fresh-off-the-grill tofu and topped with crispy shallots and red pepper flakes. The result: instantly adorable tofu. Press the tofu cubes and then marinate in a thin layer of peanut oil overnight, flipping once. Heat about a teaspoon of peanut oil in a small saute pan over medium heat. Add half of the sliced shallots and saute until crispy. Remove from the pan and lower the heat to medium-low. Add a bit more oil to the pan and add in the remaining shallots to slightly soften, about two minutes. Add in the garlic, galangal and lemongrass and scallions and saute for about 2 minutes more. Remove from the heat and stir in the chopped cilantro. Grill or saute the tofu and let it cool slightly. To hollow out the tofu, cut a deep X in one of the narrow sides. I used a grapefruit spoon to scoop out about 1/3 of the tofu inside, but a regular spoon would also work. 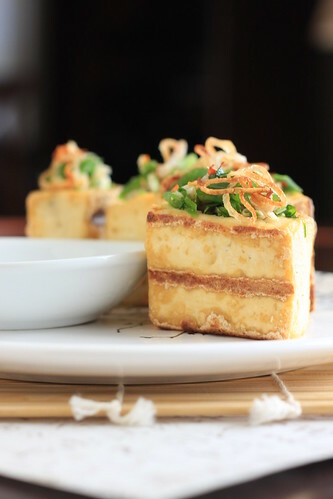 Using a small spoon or your fingers, gently stuff the tofu pieces with the lemongrass-cilantro mixture, spooning any of the remaining mixture over the top. Top everything off with the crispy shallots and red pepper flakes and serve with a soy-vinegar or dumpling sauce. Thanks Mel! The flavors are really clean and refreshing. I hope you enjoy the recipe! Thanks Jen! Lemongrass is amazing too in broths and tea. YUM, this looks/sounds amazing! Bookmarked! I'm back again to pass on an award, you can check it out at my latest post for the details. Have bookmarked a couple of your recipes which I am looking forward to trying! 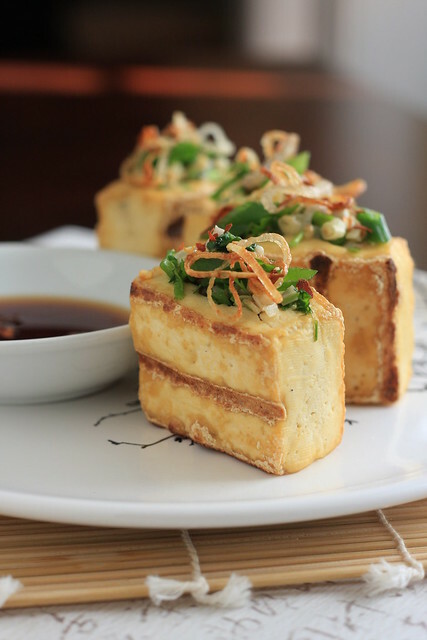 that grilled and stuffed tofu looks amazing.. i can imagine those tastes all mingling so well! WHOA. Amazing. I can't WAIT to try this! Wow, this looks gorgeous! I would be so elated to see that on my plate. I can't wait to try it, thanks! Wow, that tofu looks so perfect. I love the stuffed tofu idea! I'd have to sub something for the cilantro, but nothing beats lemongrass. Beautiful! What a beautiful picture! I've never attempted to use fresh lemongrass before, I've seen it called for in some soup recipes but this sounds much more interesting.